Photo by Daily Amar Desh. 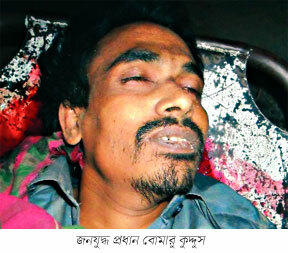 The dead was identified as Abdul Kuddus, 35, son of Montaj Uddin alias Kune Mondol of Ashwasthali village in the upazila. Kuddus, the regional chief of the party, was wanted in eight cases, including murders, police said. According to the Assistant Superintendent of Police, Md Rezaul Islam of Jhenidah RAB unit, "a team of RAB-6 after a tip off challenged at about 4:30am a gang that was roaming the area. Sensing the presence of RAB, the gang opened fire on the law enforcers, prompting them to retaliate that triggered a 'gunfight'. The outlaws, at one stage, managed to flee the scene." He says "- later, RAB found Kuddus bullet-wounded body and rushed him to Jhenidah Sadar Hospital where doctors declared him dead. RAB recovered one 9mm pistol, a locally made shutter gun, eight bullets, a wig and local and Indian coins." But he did not mention that whether Kuddus was alive or dead while RAB found his bullet wounded body! According to the doctor Kuddus was already dead when he was bought to the hospital.! Family members of Kuddus demanded that "- RAB arrested Kuddus begining of this month November from Narail District and since then Kuddus was disappeared. RAB or police never disclosed that Kuddus was arrested! Kuddus was brought to Jhenidah and executed by RAB and then RAB made the story of 'Crossfire'!" The villagers from rural area came to see Kuddus dead body! It could be mentioned that the latest extrajudicial killing took place at Savar early Tuesday when the Rapid Action Battalion killed a 28-year old young man. In an editorial the Daily New Age wrote "-Since the Awami League-led coalition took office on January 6, 2009, the law enforcing agencies have killed as many as 235 persons in so-called ‘crossfire,’ ‘encounter’ or ‘gunfight’. Notably, the High Court on December 14, 2009 directed the authorities not to kill any more people in ‘crossfire’ or ‘encounter’ until it disposes of a rule it issued suo moto on the government to explain extrajudicial killings. Since then, at least 79 people have reportedly been killed in ‘crossfire’! This is a clear contempt of the country’s highest court on the part of the government. But, for reasons known to the court authorities, it has not charged the government for its continuous contempt of court." But the Daily New Age did not count the "force disappearances" claimed by their families numbers more than 50.